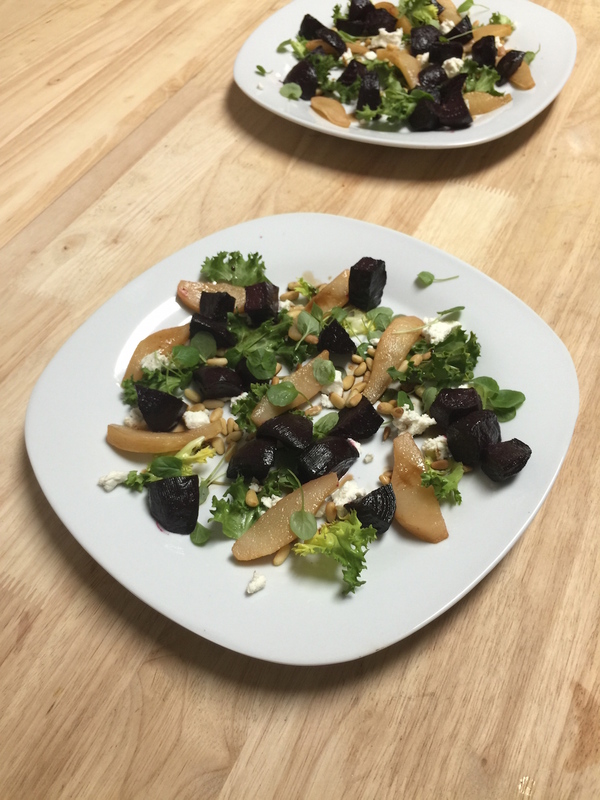 I’ve been really obsessed with beet salads lately. When I was growing up my mom was a fan of beets, and I remember being repulsed by them. 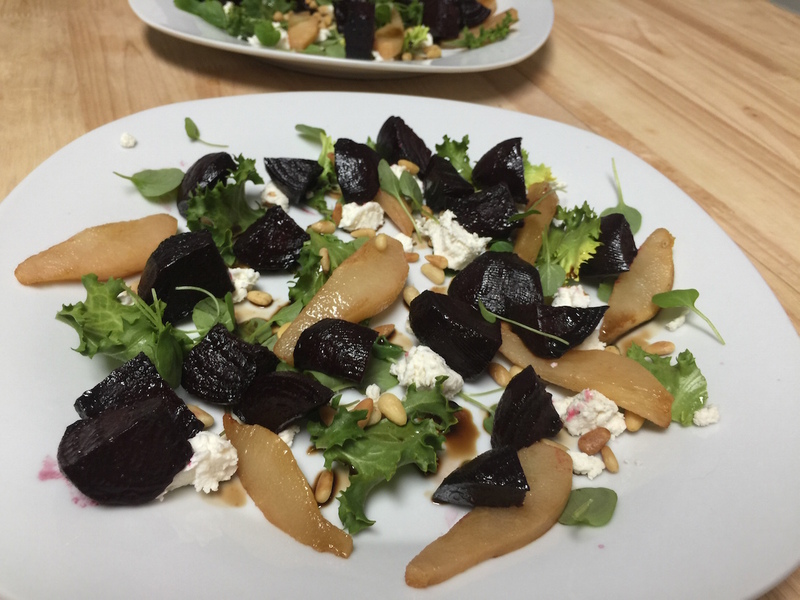 I carried that sentiment into my twenties, and only recently, with my thirty rapidly approaching, I finally revisited beets. And damn, I’ve apparently been missing out. So out of nowhere, I discovered beet salads and honestly haven’t been able to get enough. The pizzeria close to our house currently has one on their menu, one of the lunch places near my office has one, and back in December while having dinner at Giada’s in Vegas I tried her version. Now, coming up with my own take on this classic took a couple of tries. David and I have pretty much been eating beets multiple times a week for the past few months. But boy, it was totally worth it, because I really do love this salad! 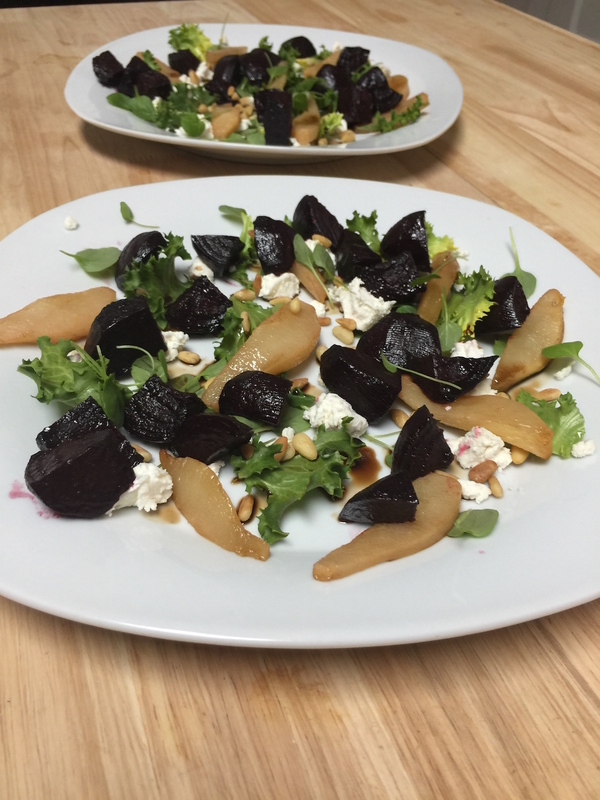 The roasted pear slices go so well with the beets, and it really gives the salad a wintery edge. Definitely try this salad! I really enjoy the combination of escarole and watercress greens. The escarole is crunchy and bitter, while the watercress is super delicate and has a subtle peppery flavor. However, if you can’t find, or don’t want to buy either, you could always go with any other of your favorite greens. Also, if you can’t find peppercorn goat cheese you could just fold cracked pepper into regular goat cheese. But you definitely want to make sure that the cheese has a pepper flavor somehow. This is a very delicate salad, so I find the pepper works better in the goat cheese as apposed to just sprinkling the plate with it. 1. Let’s start by juicing an orange to use for a citrus balsamic reduction. 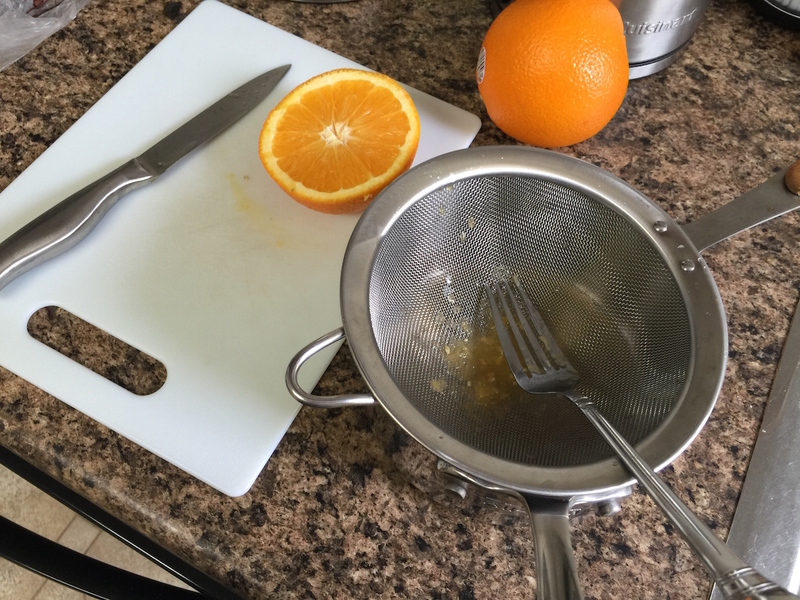 Personally, I like to juice my orange through a strainer to catch any seeds or pulp. 2. 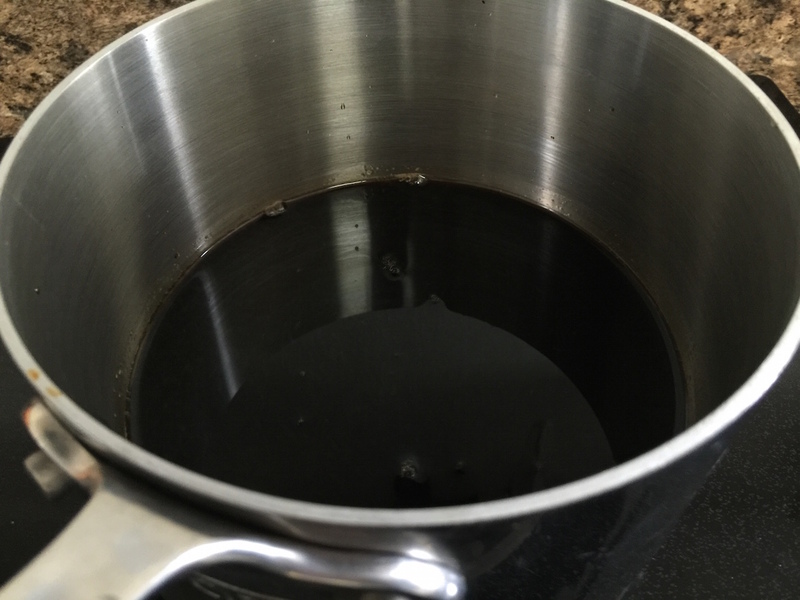 Add the balsamic vinegar and bring to a boil. 3. 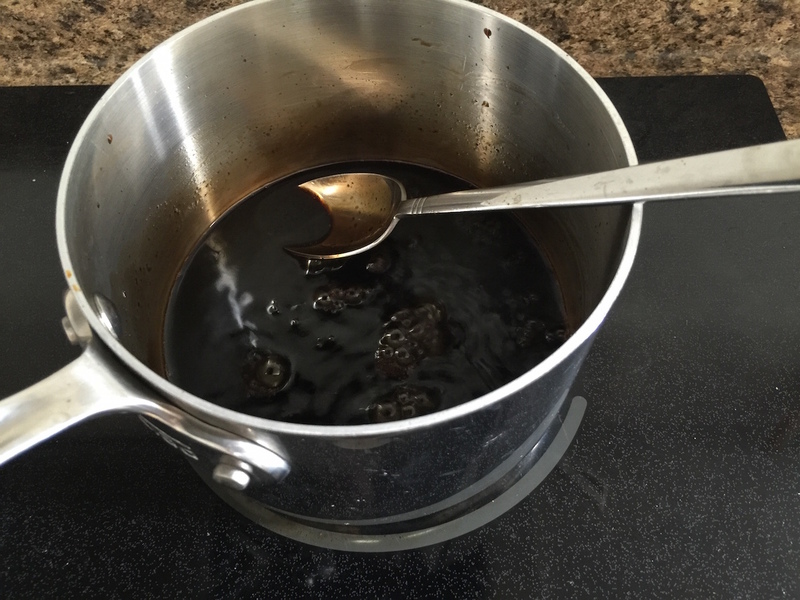 Turn the heat down to medium low and let simmer for about 15 minutes, or until reduced by about half. 4. Remove from heat, cover, and set aside for a few hours to cool completely. 5. Peel and slice beets and pears. 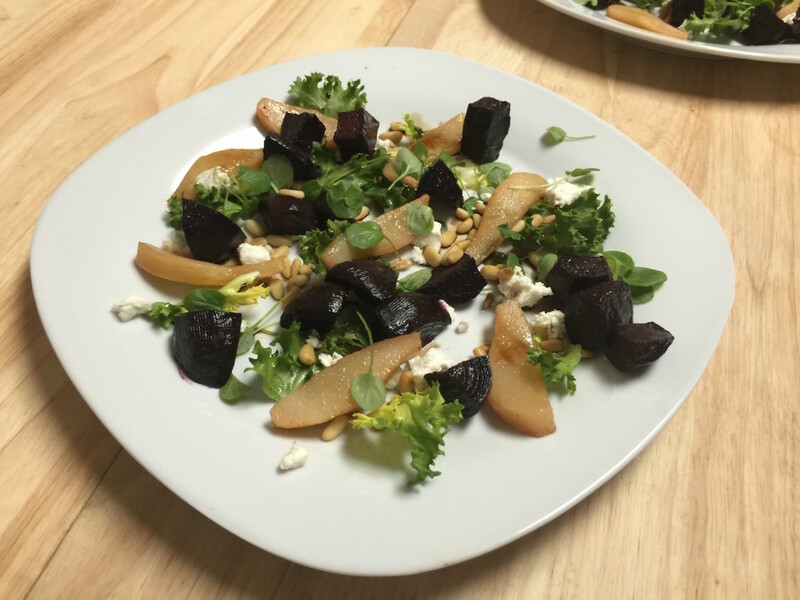 Toss beets in vegetable oil, salt, and pepper; toss pears in a squeeze of fresh orange juice. 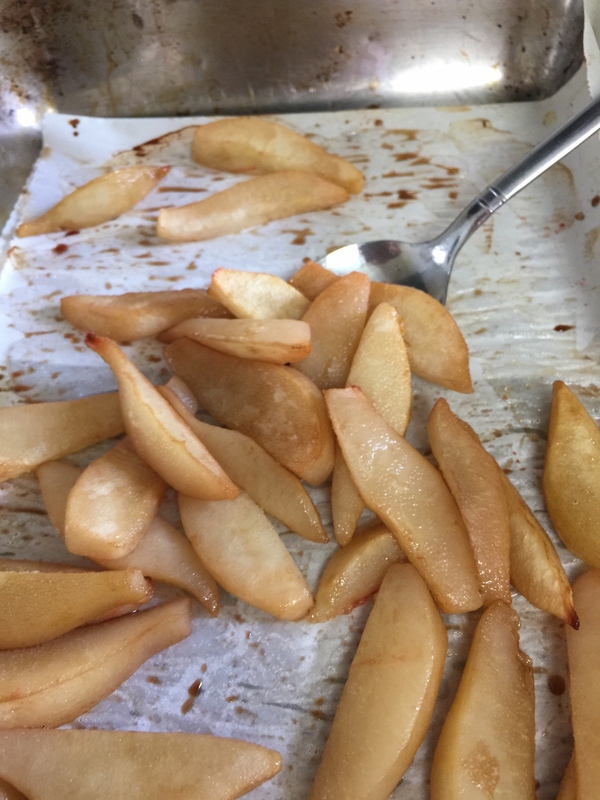 Then, roast in a parchment paper lined pan at 375 degrees for 70-80 minutes, removing from the oven briefly to toss halfway through. Note, the pears might be done about 10 minutes or so before the beets. Make sure that you keep an eye on the oven as you get closer to the end of the roasting process. 6. 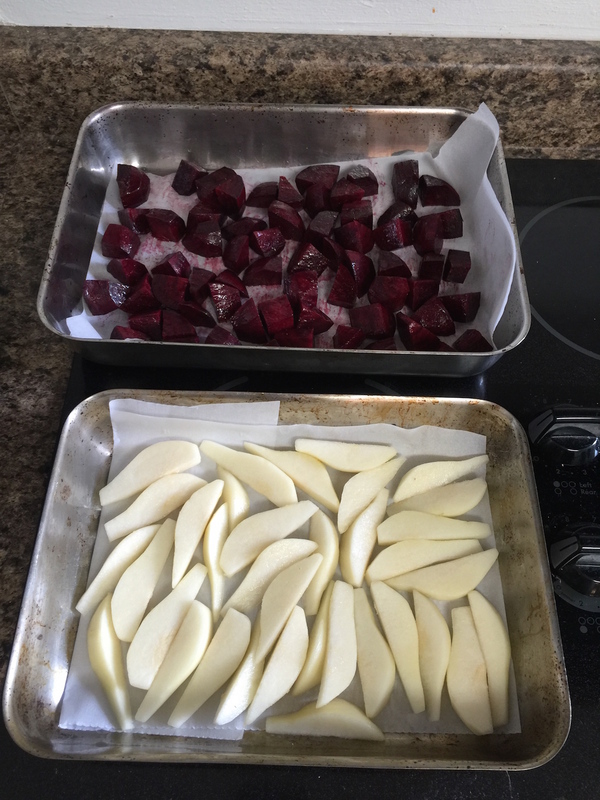 After removing from the oven, immediately toss pears in a splash of balsamic vinegar, then both balsamic and orange juice for the beets. 7. 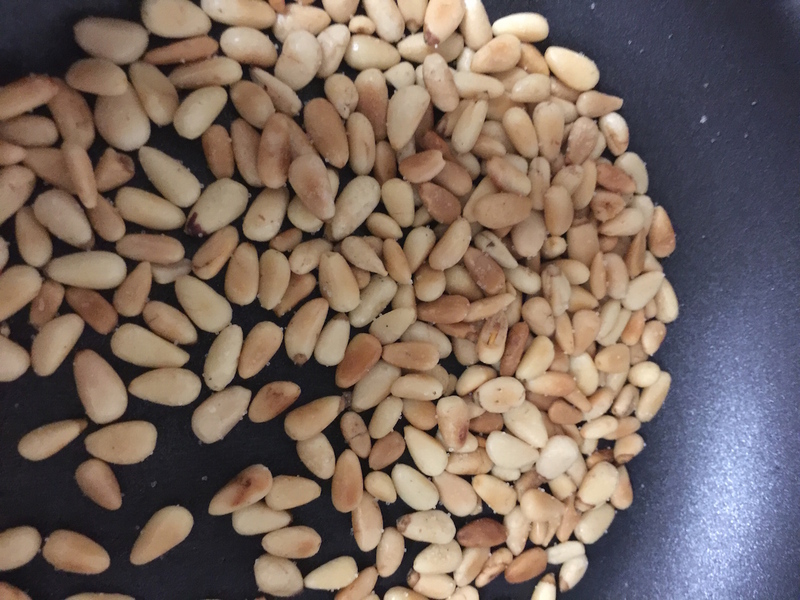 While the beets and pears are cooling (I like mine at almost refrigerator temperature) lightly roast a handful of pine nuts with a sprinkle of salt. 8. 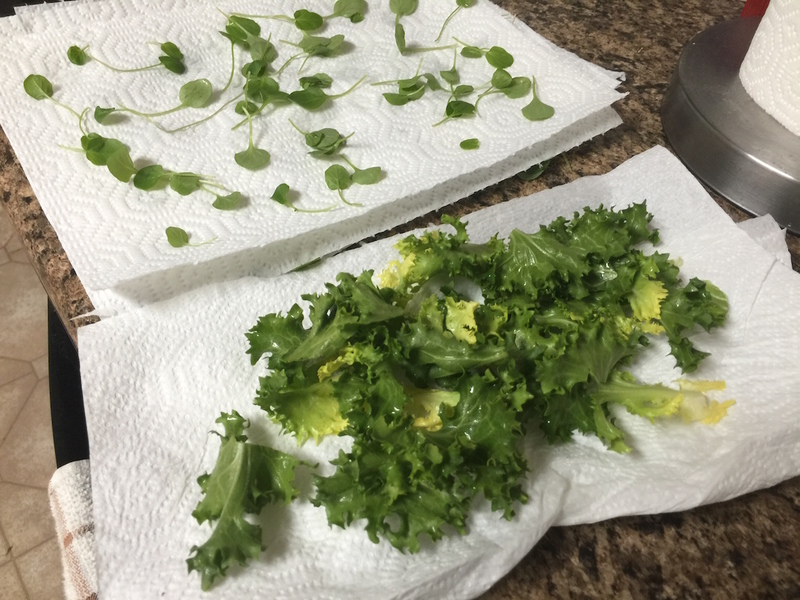 Carefully clean escarole and watercress, then pat dry with paper towels. 9. Now it’s time to assemble the salad. 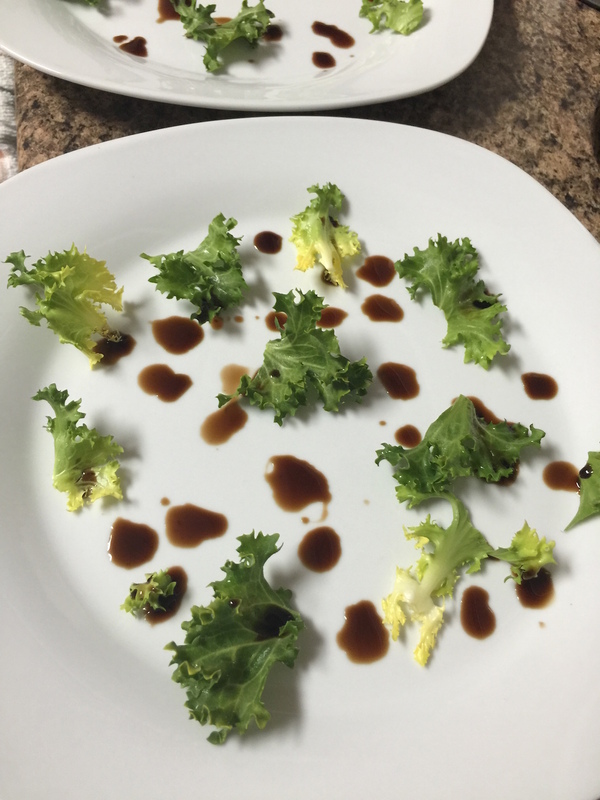 I like to start with a bit of escarole, a few drips of the citrus balsamic reduction, followed by pine nuts, chunks of goat cheese, the pears, then beets, another quick splash of the reduction, and finally a sprinkling of the watercress. I know, it sounds complicated to assemble, but it definitely makes for a gorgeous plate!